There are a lot of fancy words in dentistry and many questions about procedures and overall oral health. We’ve pulled together answers to some of the most common questions about dental care and provided links to top resources, like the ADA, where you can find more information. If you can’t find the answer you need, please give our dental office a call at 920-231-1955, or email us. How do I know if an old filling needs to be replaced? The trusted dentists at Govani Dental will let you know if an existing restoration is starting to degrade, crack or leak, and whether it needs to be replaced now or in the future. Our dental office has an intraoral camera, which captures the inside of your mouth and allows you to see the restorations yourself. Being able to investigate and see your mouth will make explanations and decisions much easier for you. When patients experience bleeding gums, they may be concerned they are brushing too hard or ask if they should brush less. In reality, bleeding may be a symptom of a larger issue. The gums are a very sensitive and an important area in your mouth. You may have the start of periodontal disease, be struggling with proper home care like brushing or flossing, or have a more serious problem. It’s best to make a dentist appointment at our offices located in Oshkosh, WI, and let one of our trusted dentists help you correct the problem. Fluoride is an element that comes from nature and can be found in drinking water and in some foods. Having adequate amounts of fluoride helps prevent tooth decay. Fluoride helps strengthen the outer surface of your teeth, called enamel. When this outer surface is strong, it’s able to prevent bacteria from causing tooth decay. When should I bring in my young infant or toddler? The American Dental Association (ADA) recommends children see a dentist within the first six months of a tooth coming in, but no later than their first birthday. This first dentist appointment is an opportunity to check to see if all the child’s teeth are coming in properly and to detect any problems like cavities. The appointment also gives the child a chance to get comfortable with the dentist from an early age, creating a positive mindset and preventing fear. As soon as teeth appear in the mouth they are at risk of decay, which is why it’s so important to start brushing right away. Begin cleaning your baby’s mouth and gums with a warm washcloth even before teeth come in. Once teeth come in, use a child-sized soft toothbrush or your finger with pediatric toothpaste. Until your child is two years old and they can spit on their own, use a very small amount of toothpaste the size of a grain of rice. 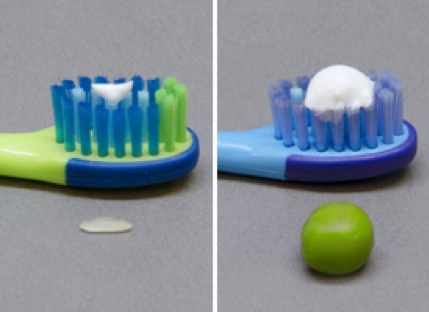 Once the child is able to spit on their own, you can start using a pea-sized amount of toothpaste. Remember to make sure the child rinses and spits out the toothpaste! Can my child go to bed with their bottle? Children should finish their bottle before bed. It’s important the child goes to bed with clean teeth. Leaving milk or other materials from sippy cups or bottles on the teeth all night can be very damaging and cause cavities. By teaching your child from an early age that brushing is part of getting ready for bed, you can instill good habits from an early age. How can I make an appointment for dental care? Just call today at 920-231-1955 or contact us using this form and we’ll call you to schedule a time that’s convenient for you. We accept many insurance plans and we’ll work with you to explain your benefits and help process claims. In addition, we accept cash, check and credit cards. CareCredit® plans are available for patients looking to pay for their dental costs with a payment plan. For more information, visit our insurance and billing page. How do I know you’ll accept my insurance? Govani Dental is considered “in-network” for Delta Dental® (Premier and PPO) and WEA Trust, but we work with most insurance carriers and accept most dental insurance plans. If you’d like to confirm that we take your insurance, just call our office at 920-231-1955, or email us. For more information, visit our insurance and billing page. 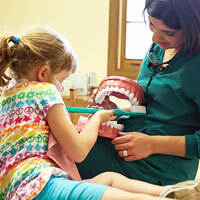 Where is the dentist office in Oshkosh located? We’re located at 1819 Evans St. in Oshkosh. Please visit our Contact Us page for directions and a map. Do you use latex in your office? No, Govani Dental buys latex-free supplies. However, some dental products may have trace amounts of latex, so any patient with a latex allergy should still report it. The dentists at Govani Dental want to ensure your complete safety. Yes, the office is handicapped accessible. We want all of our patients to be as comfortable as possible during their visit. If you require specific accommodations please let us know ahead of time by giving our office a call at 920-231-1955 or by emailing us. Can my teenager come to appointments without me? We need a parent or legal guardian to be present with patients under 18 years of age to provide the very highest standard of care. We offer evening hours and special appointment requests to help with the scheduling challenges parents face. Please email us or call 920-231-1955 to schedule an appointment today. Does your office follow infection control guidelines? Yes, it’s one of our major areas of focus. We have top-of-the-line sterilization equipment, and we follow all safety recommendations to the highest degree to ensure patients and staff members are safe. We use cassettes to keep our instruments organized, clean and protected from unnecessary exposure. What does that mean? It means that each time you visit Govani Dental we unseal a sterile set of instruments to use during your appointment. In addition, all of us wear gloves, masks and eye protection. We use only the best products to disinfect all patient rooms and surfaces. At Govani Dental, infection control and prevention is a top priority. What is your HIPAA policy? At Govani Dental we take your privacy seriously. Below you will find the HIPAA guidelines we follow and the HIPAA form we have our patients fill out.